3Weston Chiropractic individualizes your best treatment plan & offers a comprehensive orthopedic and neurological exam. 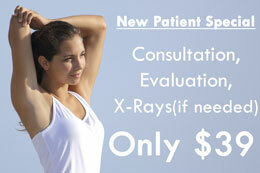 We provide any necessary diagnostic X-Rays, as well. Our care aims to give immediate & long lasting relief, as ensured by fine tuning your treatment plan. Feel free to contact us with any questions pertaining to your insurance benefits at 805-618-1001.